By John Gadsby Chapman, 1839. This painting depicts the ceremony in which Pocahontas, daughter of the influential Algonkian chief Powhatan, was baptized and given the name Rebecca in an Anglican church. It took place in 1613 or 1614 in the colony at Jamestown, Virginia, the first permanent English settlement on the North American continent. Filippo Costaggini, who had also been trained in Rome, was selected to complete the remaining eight scenes using Brumidi's sketches. When he finished in 1889 there was a gap of over 31 feet because of early miscalculations about the height of the frieze. Costaggini hoped to fill it with three of his own scenes, but Congress failed to approve his designs before his death in 1904. In 1951, Allyn Cox was commissioned to paint the last three panels tracing the growth of the nation from the Civil War through the birth of aviation. Cox also cleaned and retouched the frieze. The frieze was finally completed in 1953 and dedicated the next year. The Apotheosis of Washington in the eye of the Rotunda of the U.S. Capitol was painted in the true fresco technique by Constantino Brumidi in 1865. Suspended 180 feet above the Rotunda floor, the fresco covers an area of 4,664 square feet. The figures, up to 15 feet tall, were painted to be intelligible from close up as well as from 180 feet below. In the central group of the fresco, Brumidi depicted George Washington rising to the heavens in glory, flanked by female figures representing Liberty and Victory/Fame. A rainbow arches at his feet, and 13 maidens symbolizing the original states flank the three central figures. The subject of this painting is the surrender of the British army at Yorktown, Virginia, in 1781, which ended the last major campaign of the Revolutionary War. In the center of the scene, American General Benjamin Lincoln appears mounted on a white horse. He extends his right hand toward the sword carried by the surrendering British officer, who heads the long line of troops that extends into the background. By William H. Powell, 1853. This painting shows Spanish conquistador and explorer Hernando De Soto (1500-1542), riding a white horse and dressed in Renaissance finery, arriving at the Mississippi River at a point below Natchez on May 8, 1541. De Soto was the first European documented to have seen the river. In this painting, Christopher Columbus and members of his crew are shown on a beach in the West Indies, the first landfall of their expedition to find a westward route from Europe to China, Japan, and perhaps unknown lands. This painting depicts the moment on June 28, 1776, when the first draft of the Declaration of Independence was presented to the Second Continental Congress. This painting depicts the Pilgrims on the deck of the ship Speedwell on July 22, 1620, before they departed from Delfs Haven, Holland, for North America, where they sought religious freedom. Clio, the Muse of History, stands in a winged chariot representing the passage of time and records events as they occur. The car rests on a marble globe on which signs of the Zodiac are carved in relief. The chariot wheel is the face of the clock; its works are by Simon Willard. The event shown in this painting is the surrender of British General John Burgoyne at Saratoga, New York on October 17, 1777. This painting depicts the scene on December 23, 1783, in the Maryland State House in Annapolis when George Washington resigned his commission as commander-in-chief of the Continental Army. The richly patterned and colored tiled floors are one of the most striking features of the extensions of the U.S. Capitol. 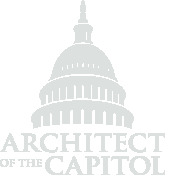 They were first installed in 1856, when Thomas U. Walter was engaged in the most ambitious architectural project of mid-nineteenth century America: the design and construction of vast additions to the United States Capitol (1851-1865). Over time, a black veil of grime developed and obscured the work of art, making it hard to distinguish from 160 feet below in the Main Reading Room. To rectify this issue, the AOC worked to restore the painting in 2010 to its original splendor. Statue of Richard B. Russell, Jr. Artist Frederick Hart of Virginia, was selected to memorialize Russell with a seven-foot marble statue. The sculptor worked from photographs of the late senator supplied by his family and the Russell Foundation. In sculpting the work, Hart tried to reflect the strong personality of Senator Russell. Vincent Palumbo, master stone carver at the National Cathedral in Washington, D.C., translated Hart's model into Carrara marble. The piece was unveiled at ceremonies held in the Russell Rotunda on January 24, 1996. The center of the marble floor represents the sun, on which the four cardinal points of the compass are noted. The 12 squares at the perimeter of the floor of the Great Hall represent the signs of the zodiac.